Plot Summary: It is the year A.D. 2307. Fossil fuels on Earth have been depleted entirely, with mankind turning to the next available power source: solar energy. During this time, 3 orbital elevators with solar power generation systems are built, each under control by the Union of Solar Energy and Free Nations (formerly United States of America), the Human Reform League (Russia, China and India) and the Advanced European Union. However, not all countries are able to enjoy the benefits of this system, leading to widespread resentment and war. Arising out of the conflict, a mysterious military organization known as Celestial Being appears, dedicated to end all warfare using Mobile Suits called Gundam. 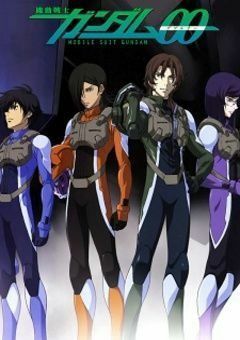 This begins the stories of Gundam Meisters (pilots) Setsuna F. Seiei, Lockon Stratos, Allelujah Haptism and Tiera Erde as they are thrown into conflict between the 3 superpowers and the various other factions.